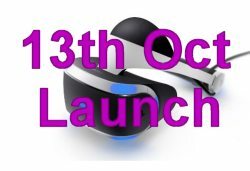 Sony has confirmed at the E3 gaming Conference that the Playstation VR will be released in the UK on Thursday 13th October 2016 (Same date as the United States). The other countries included with the same release date are Australia, Austria, Belgium, Czech Republic, Denmark, Finland, France, Germany, Greece, Ireland, Italy, Luxembourg, Netherlands, New Zealand, Norway, Poland, Portugal, Russia, Saudi Arabia, Spain, Sweden, Switzerland and United Arab Emirates. Meanwhile, Sony CEO Andrew House confirmed in an interview with CNBC channel that he believed the the PlayStation VR will initally be "supply constrained" with stock shortages very likely.